FREDERICK, MD-The Frederick Keys are pleased to announce Frederick Keys Care grant recipients for 2018-19. Established in 1999, Keys Care supports non-profit organizations who provide direct aid to underprivileged youth and young adults in Frederick County. Keys Care was established as the Joel A. Stephens Memorial fund and honors the legacy of former Orioles farmhand Joel Stephens. Passing away at 22 years old due to colon cancer, Joel's commitment to community service and helping others distinguished him as a player. The Frederick Keys Care Fund is part of the Community Foundation of Frederick County's Universal Grant Application funding program. Grants are awarded during the fall each year for the next calendar year. Any 501 (c) (3) organization in Frederick County who provides direct services to county youth can apply on behalf of their programs. Keys Care has awarded more than $80,000 in grants to local youth-based organizations. For 2018-19, a grant amount of $10,000 will be distributed among six different organizations. YMCA: For the YMCA Kids Unlimited program. This provides summer camps to children with autism and other special needs. Campers will take place in general camp programs and activities and will be supervised by YMCA staff trained to work with special needs children from ages 4-20. Participants can branch out with arts and crafts, sensory activities, cooking, sports and group games. Additionally, special needs campers will participate in integrated activities with other neurotypical peers to facilitate development of social skills ($1,856.25). Heartly House: Serves individuals who have been victims of domestic violence, sexual assault and child abuse. Heartly House has worked with youth in Frederick County for nearly 40 years. Dr. Monica Pentony works with families and children affected by trauma and offers vital service components to families on their path to healing. She employs art activities, play therapy and animal assisted therapy as means of providing a safe and comfortable environment for children and others to express and understand their feelings ($2,500). Student Homelessness Initiative Partnership (SHIP): Assists homeless FCPS students gain necessary resources to graduate from high school. SHIP also provides economic aid and work force learning access. Funds will go towards the 4th annual New Horizons summer program. Students can catch up on important academic courses, learn new life skills to build resilience and develop economic independence through job skills training and work experience. Over the past three years, nearly 90% of participants complete the program and are on track for on-time graduation ($1,435.37). Sophie & Madigan's Playground: Goes towards building a playground which addresses the play needs of all individuals. Funds will assist with the installation of the poured in place ground covering. Poured in place is the safest and most accessible ground cover available and is safe for a wheel chair, other mobility aid device, or someone with gait differences to move over the area with ease. The ground also adds visual sensory input. Playgrounds similar to the vision for the Sophie and Madigan Lillard Memorial playground enjoy approximately 25,000 visitors each month ($3,000). Advocates for Homeless Families: This year's grant will pay for enriching after-school and summer activities. Supervised summer activities include karate, tennis, dance, cooking, athletics, church and day camp. Grant funding covers activity fees, pool passes and other costs ($1,000). Blessings in a Backpack: Supplies weekend backpacks of food to children from pre-kindergarten to eighth grade who depend on school meals as their primary source of food from Monday-Friday. In 2015-16, Blessings in a Backpack received a special request to help special needs young adults. These individuals deal with food insecurity over weekends and during school breaks when meals are not available. This grant assists with servings these students for the fourth straight year. In addition to receiving food, these students are helped with inventory control, reading labels, checking expiration dates, packing food and following menus ($750). 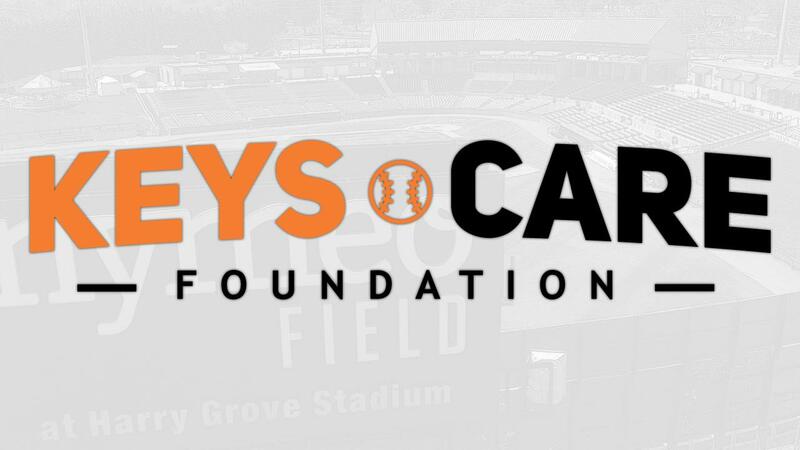 Organizations selected for Keys Care funding are invited to attend the annual Frederick Keys Care Charity Golf Classic where they will be honored. Fund recipients will also be recognized prior to a 2019 game. To apply for a Keys Care Grant or to find out ways to donate to Frederick Keys Care, fans can visit frederickkeys.com and click on the Community tab.